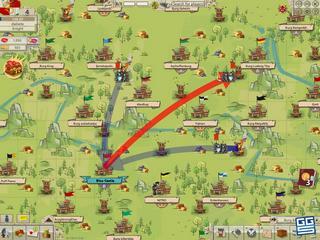 Goodgame Empire is another great simulation game. The game is military themed and full of things for you to do if you dare to start this journey. This kind of invironment might be more interesting than something like spa or even farming for the male players. All the characters have their own distictive features according to their occupation. There's no particular story to the game told to you. You kind of join the party and make your own history of events. ALmost the first thing that happens to you is you are given a status of a knight after a successful attack on your enemy. Right after that, you are to build and develop or own fortress. The graphics of this game are very bright and sharp and attractive. All the characters have their own distictive features according to their occupation. Those characters are the ones who actually tell you what to do. They tell you military news or things that need to be updated or changed within your own "empire" or come to collect the taxes. This is the part of the game that is very well thought through. There's always one more task for you to do. There's a tutorial showing you where to go to accomplish certain assignments. All the sides of the screen are the areas of different kinds of information. Most of times you will go to the bottom of the screen because that is where the different menues are found. 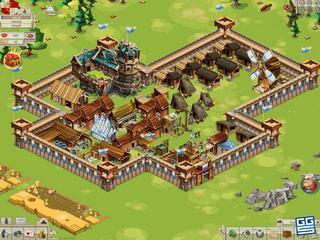 You go there for building different kinds of buildings or if you need to recruit soldiers. 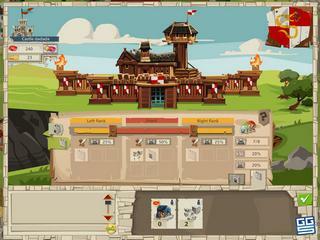 On the right, you can find the general game menu and a messanger to interact with. The topof the screen is where the resources are found. And the left side of the screen is to check on your progress. The game is very entertaining and keeps you involved for a long time. This is Goodgame Empire review. Download this game here.